Looking into the original shop reveals a mix of goods. Tins of soup, boxes of fruit juice, packets of biscuits and in the left hand window, household cleaning products, toothpaste and soap. Walcot Square is in Lambeth. 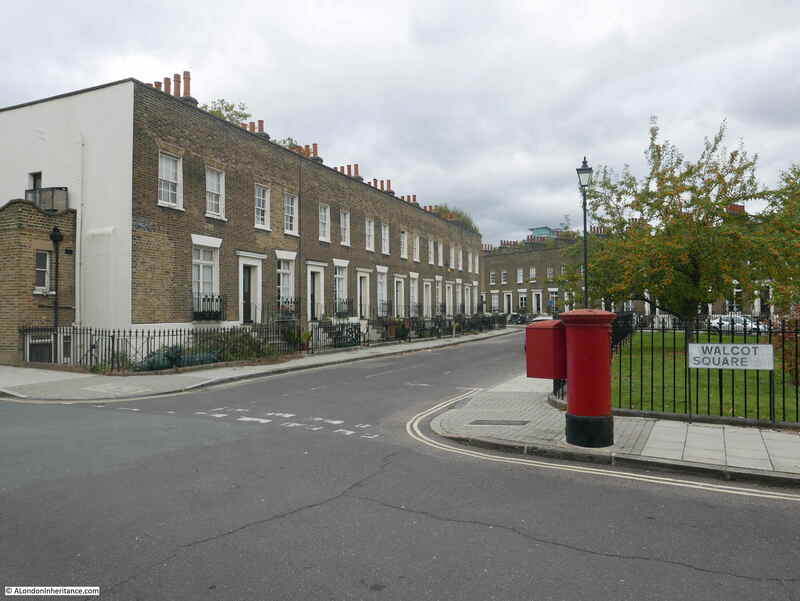 Follow the Kennington Road, and just after the grounds of the Imperial War Museum are a couple of streets that lead into an early 19th century development centered on Walcot Square. in the following map, Kennington Road is the vertical orange road in the centre. The Imperial War Museum is at the centre top, and just below this is the Walcot Estate centred around two triangular greens, just to the right of Kennington Road. 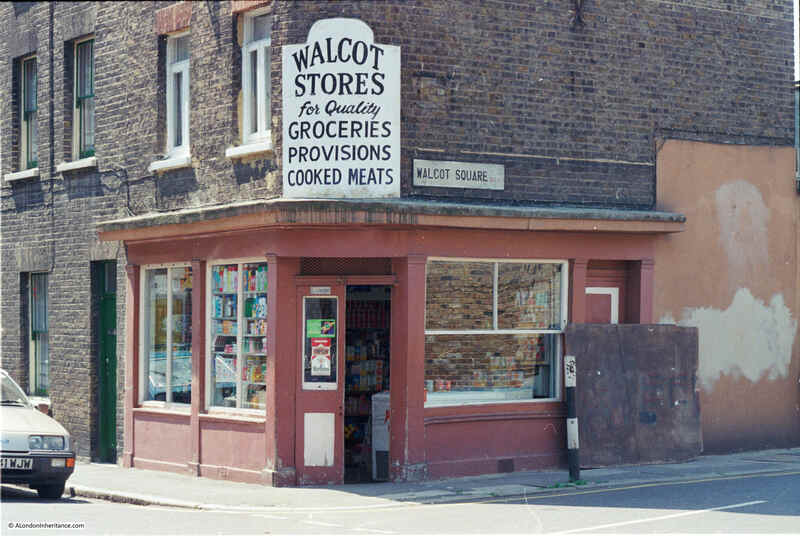 The Walcot Estate is one of those places that can be found across London which have a very distinctive character and are different to their surroundings. I have written about similar estates before, such as the Lloyd Baker estate. The land in this part of Lambeth was once owned by the Earls of Arundel, then the Dukes of Norfolk. In 1559, Thomas, Duke of Norfolk sold a parcel of land, and in 1657 this land was sold to Edmund Walcot. There must have been a family connection to the area as Edmund’s uncle, Richard Walcot also owned some local land which Edmund inherited. Edmund left the land in trust to St. Mary Lambeth and St. Olave, Southwark, for the benefit of the poor. At this time the majority of the land was undeveloped, apart from some limited building, it was mainly used for agricultural purposes. 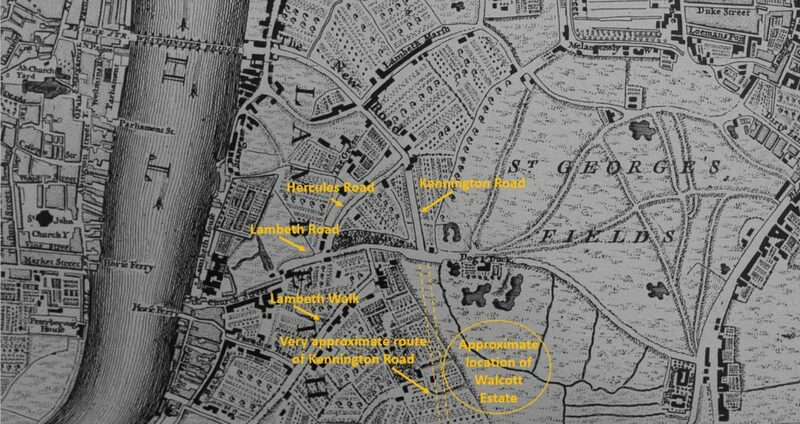 The land left to St. Mary and St. Olave went through a number of partitions, enabling the two parishes to own their specific block of land, with the line of the present day Kennington Road roughly forming the border between the partitioned land. Building commenced in the early years of the 19th century. Walcot Square was constructed between 1837 and 1839. The name Walcot Square does not fit the area. Walcot recalls Edmund Walcot who left the land in trust to the parishes, however the area is not really a square. The grassed section in the middle is more a triangle than a square, whilst the name also extends along the road that leads down to Kennington Road and up towards Brook Drive. 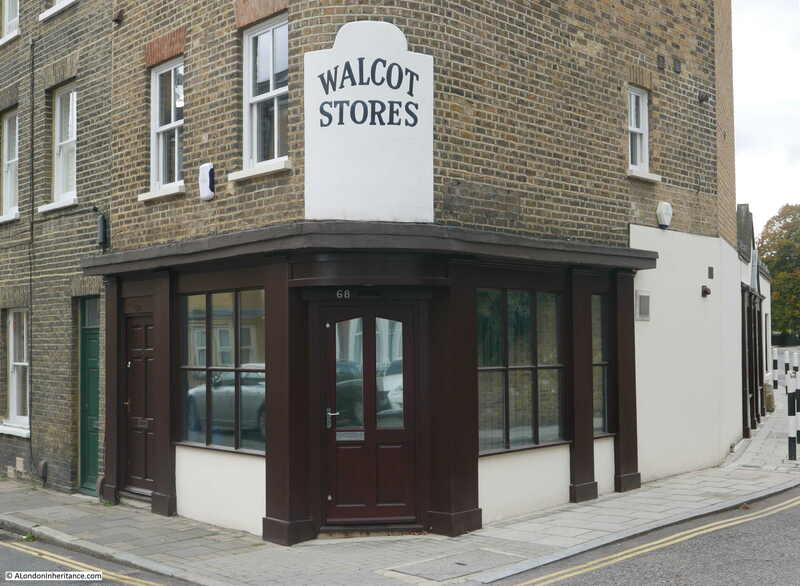 The Walcot Stores were at the eastern end of Walcot Square, towards Brook Drive. After photographing the old store front, I walked along Walcot Square towards the central grassed area. In the following photo, the old shop is in the building on the left. In the front of the single storey building is a very old looking stone. A closer examination reveals a stone with a number of inscriptions. The date appears to be 1779. The stone pre-dates the construction of Walcot Square so was probably a boundary stone, possibly to show the land had been partitioned between the parishes of St. Mary and St. Olave. I checked John Rocque’s 1746 map to see if I could find any obvious boundary (assuming that the boundary was in place 33 years before the date on the stone). The following map extract shows the area in 1746. Some of the main roads that exist today could also be found in 1746. Part of Kennington Road along with Hercules Road, Lambeth Road and Lambeth Walk. I have marked roughly where Kennington Road extends today and also the area occupied by the Walcot Estate, which in 1746 mainly consisted of fields. 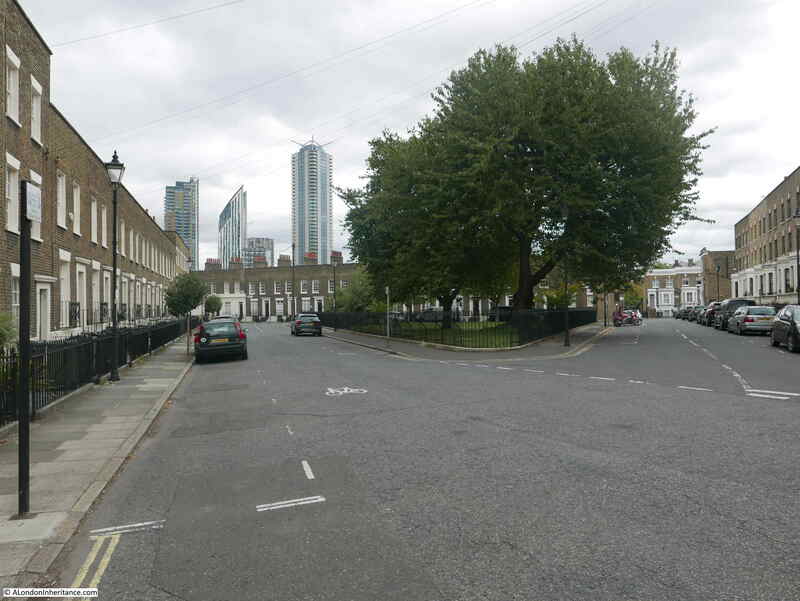 There is a very hard boundary running diagonally down from Lambeth Road with cultivated agricultural land on the left and open fields on the right. This may have been the partition between St. Mary and St. Olave’s land, however the boundary does not look to be where the stone is to be found today – this is assuming that the stone is in the original location, Rocque’s map is correctly drawn and scaled, and that my interpretation of where the future extension to Kennington Road would run, and the future location of the Walcot Estate is correct. 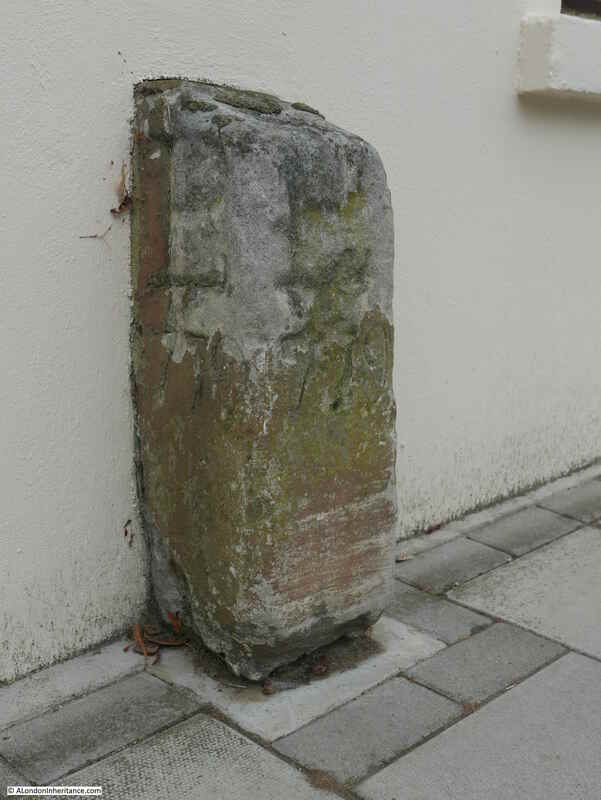 Again, one of the problems with my blog where I worry I do not have enough time to research the detail – however I found it fascinating to find that a boundary stone that pre-dates the building of the entire estate can still be found. Walking from the location of the shop, a short distance along Walcot Square brings us to the main area that could be considered a square. 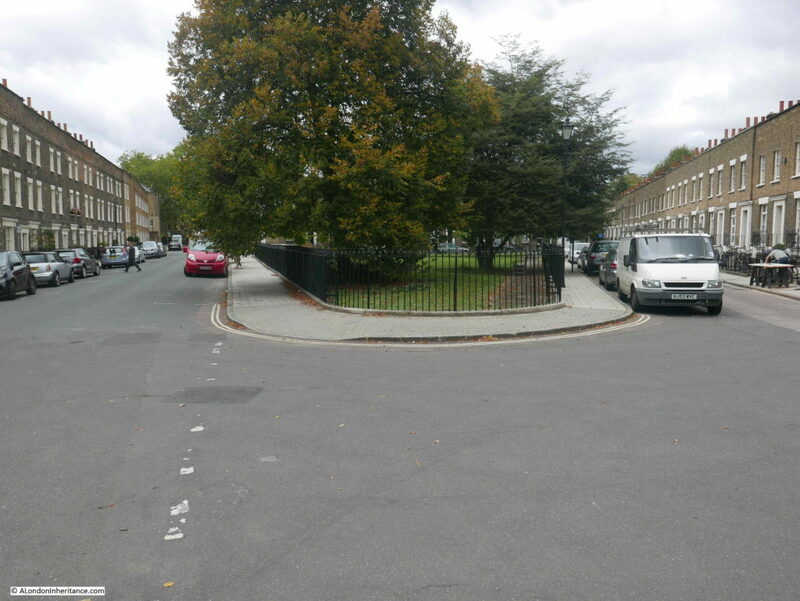 Here, the view is looking in the direction of Kennington Road with one of the corners of the triangle of grass, and the houses of Walcot Square on either side. The square and housing was built between 1837 and 1839. 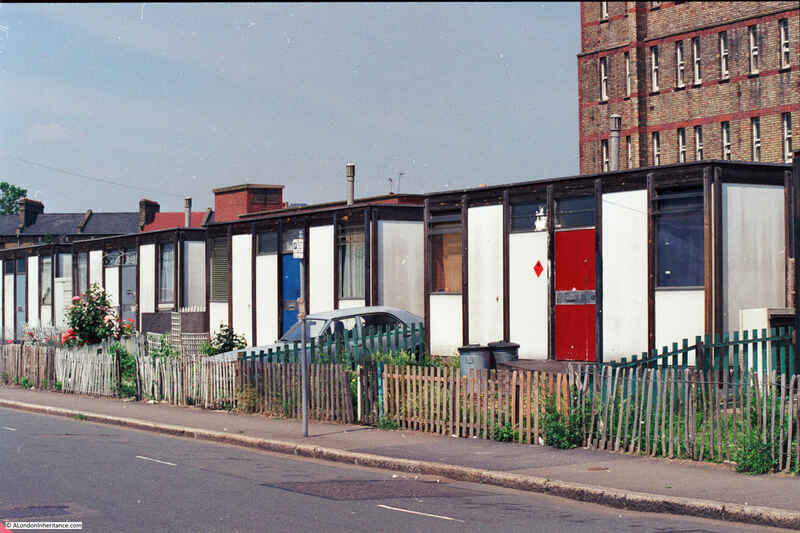 The Kenning Road extension had already been built, along with the large houses that faced onto Kennington Road, so Walcot Square was the typical expansion of building back from the main roads into the fields. The square consists of two and three storey houses, along with a small basement. the ground floor is raised so a small set of steps leads up from the street to the front door. The north western corner of the square ends in a short stub of a street. 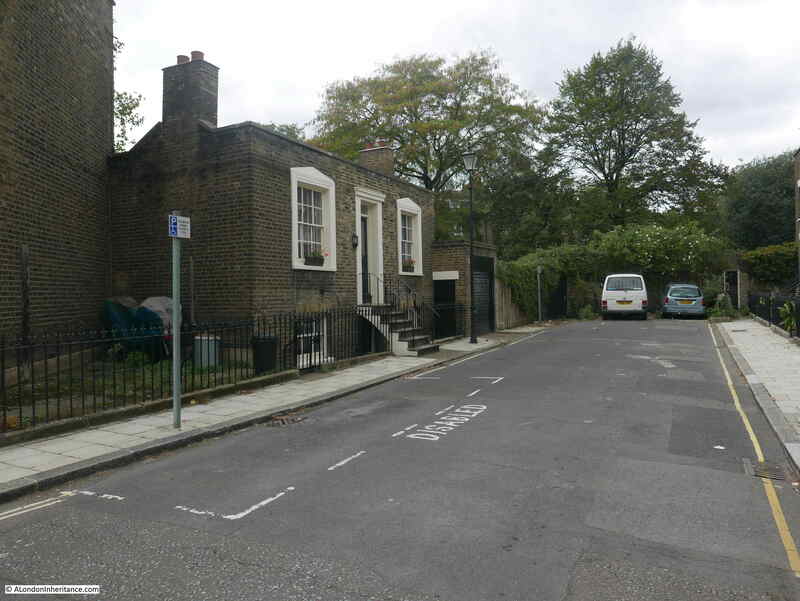 The large gardens of the houses facing onto Kennington Road block the street. 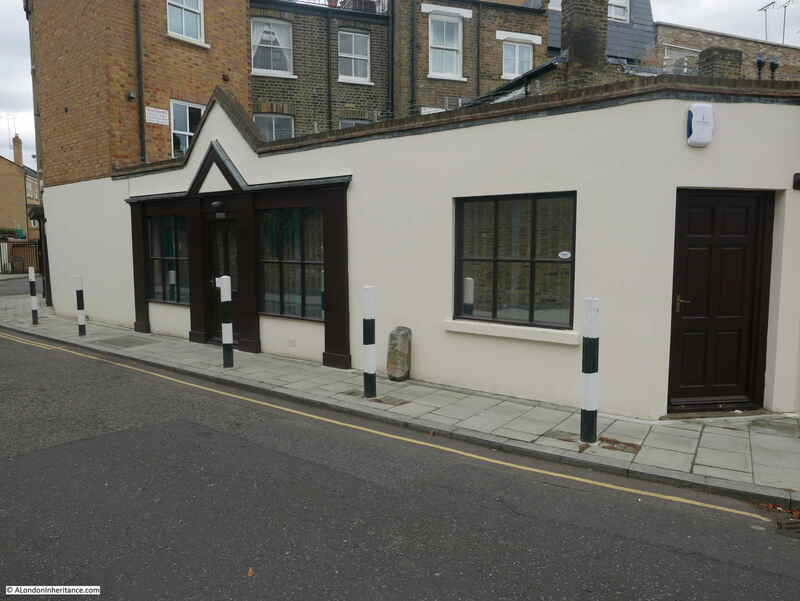 On the left is a rather attractive single storey building with a part basement below. The unusual design is probably because of the limited space behind, as this building could not intrude into the gardens of the house on the left. I wonder if it was the original intention to purchase the houses and land that block the extension on to Kennington Road and extend the above street and Walcot Square housing directly onto Kennington Road? 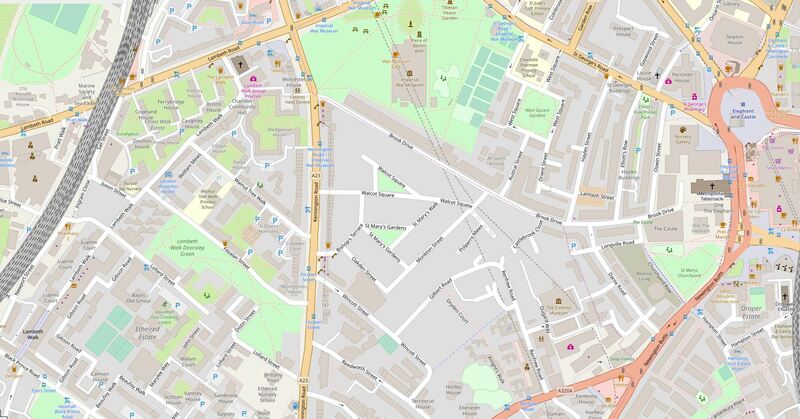 Leaving Walcot Square, walk along Bishop’s Terrace and you will find St. Mary’s Gardens (which must have been named after St. Mary, Lambeth, one of the parishes that had received the land in trust from Edmund Walcot). The layout is almost a mirror image of Walcot Square, with a triangular central garden. St. Mary’s Gardens was built at around the same time as Walcot Square so is of 1830s design and construction. Compared to the continuous stream of traffic along Kennington Road, the streets of the Walcot Estate are quiet, and apart from the street parking, the general appearance of Walcot Square and St. Mary’s Gardens are much the same as when the estate was completed in the 1830s. 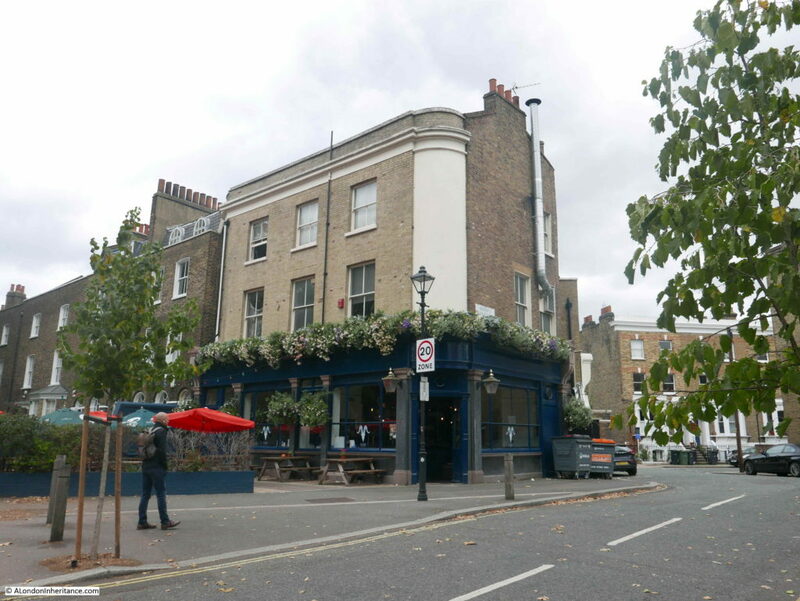 The pub was until very recently the Ship, but appears to have had a name change to The Walcot 1830 – a clear reference to the construction decade of the adjacent estate. Nothing to do with the Walcot Estate, but these must be in the local area. Whilst the prefabs have almost certainly long gone, I was hoping that the distinctive building in the background could still be found, however after a lengthy walk through the streets of this part of Lambeth, I could not find the building in the background, so the street in which these prefabs were to be found in the 1980s remains a mystery. It would be great to know if any reader recognises the location. This entry was posted in London Streets and tagged Kennington Road, Lambeth, Walcot Square on November 4, 2018 by admin.